Took my first Helicopter ride on Saturday over Central Geelong and loved it. I'm not the adventurous type but really enjoyed the experience thanks to Chad. Definitely take another flight only next time I'd pick a longer one! Amazing views and great service. Highly recommend seeing Geelong and the surfcoast from above!!! I would like to thank Geelong helicopters for the amazing work they did helping with my proposal. Especially Anton and Steve for organising everything to the finest details, nothing was to hard it couldn't have gone any smoother. Thanks guys Joel. Helicopter flights make a wonderful gift for birthdays, Christmas, anniversaries, wedding presents and other special occasions. Gift Certificates are available to purchase over the phone or at the Geelong Waterfront. Geelong Helicopters is built on the foundations of Heli Surveys, our well-established business in NSW. If you would like to find out more about Heli Surveys please click here. We pride ourselves on being able to provide the best possible service and make each flight special. If you need to ask any questions or would like to discuss a flight or private charter please contact us at any time. Geelong Helicopters predominantly operates from the Yarra Street Pier on the Geelong Waterfront. 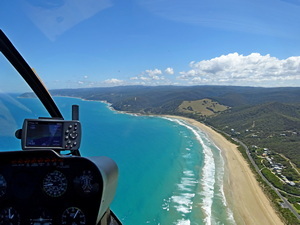 We also offer several scenic flights from the Barwon Heads airport, contact us to make a booking.